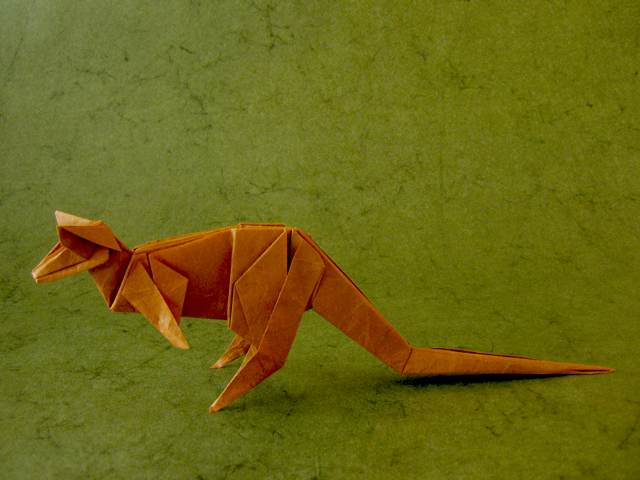 Today I decided to try and fold a model with one of my larger sheets of Unryu - untreated. The paper is thin except for in the places with the large, natural fibers. It makes the paper super beautiful, but also a bit harder to work with. Usually, you'd glue this paper to foil or some other backer sheet, but I felt like giving it a try as is. The paper was almost too weak to hold the kangaroo on its hind legs, but thankfully the paper was strong enough. I also didn't find the paper too soft to work with, although slightly crisper paper would have probably helped.